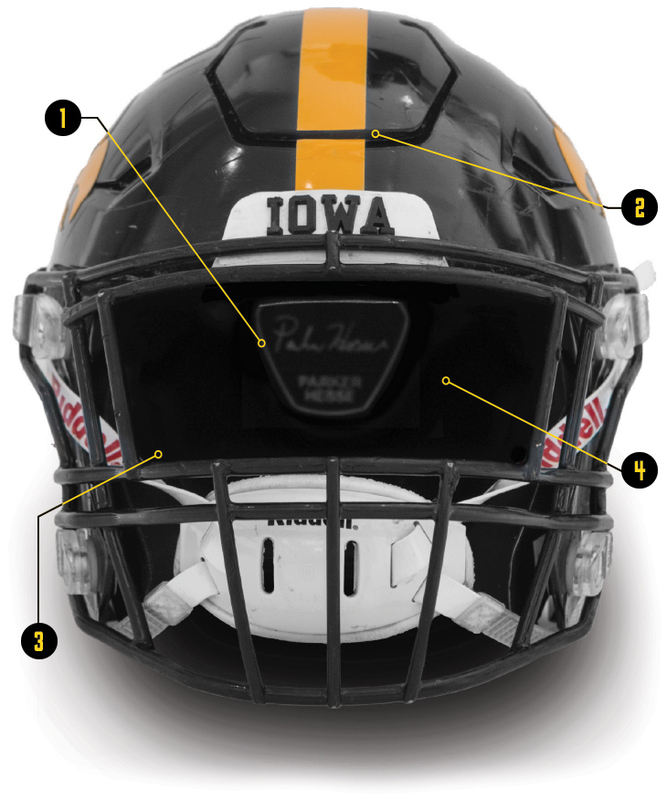 Iowa's first-in-the-nation helmet technology is engineered to bolster player safety. On the outside, Iowa's football helmets will look much the same as past years when the Hawkeyes open the season Sept. 1 against Northern Illinois. But under the hood, the Tigerhawk-branded helmets are getting an overhaul designed to boost player protection and comfort. The Hawkeyes will be the first team in the nation to outfit the majority of its players with Riddell's new "Precision-Fit" helmets, which feature interior padding that's custom molded to each player's head using advanced 3-D scanning technology. Iowa Alumni Magazine dropped by the Hansen Football Performance Center during spring practices to get the lowdown on the new helmets from longtime equipment manager Greg Morris (84BGS). Pictured here is the helmet of Hawkeye defensive end Parker Hesse, who donned one of the new models last season. Inside is a nameplate with each player's signature. As in past versions, the helmet features a flexible cutout on its crown designed to reduce impact force transfer. Riddell integrated its new custom padding system with its earlier "SpeedFlex" helmet model, which reduces the force of impact using flexible pieces. Because players are able to choose how the helmet is positioned on their head, they'll benefit from improved sightlines and field vision. Select players nationwide wore prototypes of the Precision-Fit helmets the past two seasons, including 15 Hawkeyes in high-impact positions. This year, every returning Iowa player will be outfitted with the new helmets, while true freshmen will receive theirs next winter. To build the custom helmets, a Riddell representative visited Iowa City earlier this year and used a handheld scanner to map the contours of each player's head. Using the precise 3-D models, Riddell manufactures the custom interior padding. Previously, helmet pads were adjusted using hand pumps.